Museum Het Rembrandthuis (Rembrandt House) and Willet-Holthuysen Museum will appeal to history buffs. Get a sense of the local culture at Rijksmuseum and Van Gogh Museum. Get out of town with these interesting Amsterdam side-trips: UNESCO World Heritage Kinderdijk (in Kinderdijk) and The Mauritshuis Royal Picture Gallery (in The Hague). 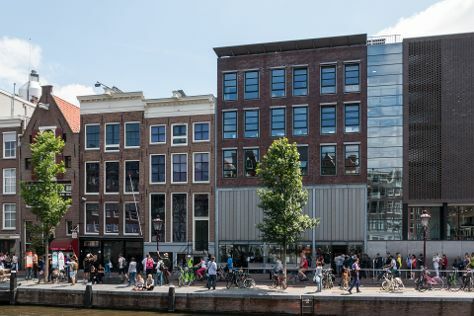 And it doesn't end there: examine the collection at Anne Frank House, get curious at NEMO Science Museum, stroll through ARTIS, and explore the world behind art at Stedelijk Museum Amsterdam. To find reviews, traveler tips, other places to visit, and other tourist information, read our Amsterdam trip planner. Fresno, USA to Amsterdam is an approximately 16.5-hour flight. The time zone difference when traveling from Fresno to Amsterdam is 9 hours. Traveling from Fresno in May, you will find days in Amsterdam are colder (63°F), and nights are little chillier (48°F). Cap off your sightseeing on the 3rd (Mon) early enough to travel to Glasgow. The Riverside Museum of Transport and Travel and Buchanan Street are good opportunities to explore the local culture. Eschew the tourist crowds and head to The Necropolis and Cathkin Braes County Park Mountain Bike Trails. There's lots more to do: admire the masterpieces at Kelvingrove Art Gallery and Museum, get engrossed in the history at The Tenement House, get curious at Glasgow Science Centre, and examine the collection at The Museum of Piping. For traveler tips, ratings, and other tourist information, refer to the Glasgow online tour builder . Traveling by flight from Amsterdam to Glasgow takes 4.5 hours. Alternatively, you can take a train; or drive. The time zone difference moving from Central European Time to Greenwich Mean Time is minus 1 hour. In June in Glasgow, expect temperatures between 64°F during the day and 49°F at night. Finish your sightseeing early on the 8th (Sat) to allow enough time to travel to Oslo. You'll explore and learn at Fram Polar Ship Museum and Holmenkollen Ski Museum and Ski Jump Tower. Visiting Nordmarka and Oslomarka will get you outdoors. You'll find plenty of places to visit near Oslo: Gran Municipality (Sosterkirkene & Glasslaven kunstsenter). 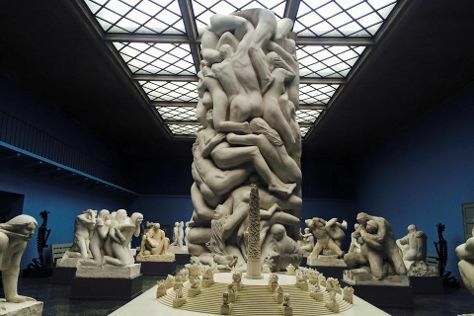 There's still lots to do: admire the masterpieces at Vigeland Museum, have fun and explore at The Kon-Tiki Museum, take in nature's colorful creations at Vigelandsparken, and step into the grandiose world of Akershus Castle and Fortress (Akershus Slott og Festning). For where to stay, maps, more things to do, and more tourist information, read Oslo online trip maker . Traveling by flight from Glasgow to Oslo takes 5.5 hours. Alternatively, you can do a combination of train and flight; or do a combination of flight and train. The time zone changes from Greenwich Mean Time (GMT) to Central European Time (CET), which is usually a 1 hour difference. Expect a daytime high around 67°F in June, and nighttime lows around 46°F. Finish up your sightseeing early on the 14th (Fri) so you can travel to Stockholm. Popular historic sites such as Royal Palace and Monteliusvagen are in your itinerary. Get outdoors at Stockholm Old Town and The Green Trails. Venture out of the city with trips to Modelljarnvagens Hus (in Alunda) and Albert Engstrom Museet (in Grisslehamn). Next up on the itinerary: examine the collection at Skansen, brush up on your military savvy at Army Museum, admire the masterpieces at Prins Eugens Waldemarsudde, and take an in-depth tour of Nordiska museet. For ratings, reviews, other places to visit, and tourist information, refer to the Stockholm trip builder app . Fly from Oslo to Stockholm in 3 hours. Alternatively, you can take a train; or drive. Expect a daytime high around 67°F in June, and nighttime lows around 50°F. Finish your sightseeing early on the 20th (Thu) so you can travel to Helsingoer. Home to the castle made famous by Shakespeare's "Hamlet," Helsingoer offers rolling hills and lush forests in the countryside, juxtaposed by the acclaimed art galleries, museums, and cosmopolitan atmosphere of the town center. Start off your visit on the 21st (Fri): learn more about the world around you at Frederiksborg Castle and then see the interesting displays at Kronborg. To see reviews, more things to do, ratings, and tourist information, refer to the Helsingoer trip planner . The Route module can help you plan travel from Stockholm to Helsingoer. In June, daily temperatures in Helsingoer can reach 67°F, while at night they dip to 50°F. Cap off your sightseeing on the 21st (Fri) early enough to travel to Hamburg. Get a sense of the local culture at Miniatur Wunderland and Speicherstadt. Appreciate the collections at Hitzacker Museum and Kunsthalle Hamburg. Venture out of the city with trips to Erstes Deutsches Fliesenmuseum (in Boizenburg), Luneburg (Kloster Lune & Stintmarkt im Luneburger Hafen) and Schwerin (Schwerin Cathedral & Schwerin Castle (Schweriner Schloss)). There's still lots to do: contemplate the waterfront views at Port of Hamburg, admire the landmark architecture of Church of St. Michael, appreciate the extensive heritage of Alter Elbtunnel, and examine the collection at Deutsches Panzermuseum. For photos, more things to do, traveler tips, and more tourist information, you can read our Hamburg day trip planning tool . The Route module can help you plan travel from Helsingoer to Hamburg. In June, daily temperatures in Hamburg can reach 69°F, while at night they dip to 51°F. Finish your sightseeing early on the 27th (Thu) to allow enough time to travel to Prague. You'll explore the less-touristy side of things at Prague Zoo and Ossuary / The Cemetery Church. Visit St. Vitus Cathedral and Cathedral of St. Barbara for their historical value. The adventure continues: get to know the fascinating history of Prague Castle, contemplate in the serene atmosphere at Kostel sv. Mikuláše, get great views at Prague Astronomical Clock, and take in the views from Charles Bridge. For traveler tips, maps, more things to do, and more tourist information, read Prague trip itinerary planning tool . You can fly from Hamburg to Prague in 4.5 hours. Other options are to drive; or take a train. In June, daytime highs in Prague are 72°F, while nighttime lows are 55°F. Wrap up your sightseeing on the 3rd (Wed) early enough to travel to Zurich. Get a sense of the local culture at Swiss National Museum and Friedhof Fluntern (Fluntern Cemetery). Escape the urban bustle at Parasailing & Paragliding and Rhine Falls. Change things up with these side-trips from Zurich: Lucerne (Lake Lucerne, Chapel Bridge, & more) and Bumblebee Hanggliding Interlaken (in Matten bei Interlaken). And it doesn't end there: take a stroll through Old Town (Altstadt), admire nature's wide array of creatures at Zoo Zurich, explore the world behind art at Museum of Art (Kunsthaus Zurich), and contemplate in the serene atmosphere at Fraumünster Church. To see ratings, where to stay, maps, and other tourist information, refer to the Zurich trip itinerary site . You can fly from Prague to Zurich in 4.5 hours. Other options are to do a combination of bus and flight; or drive. In July, daily temperatures in Zurich can reach 78°F, while at night they dip to 59°F. Cap off your sightseeing on the 9th (Tue) early enough to travel to Marseille. 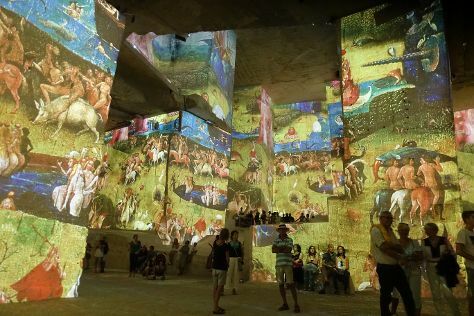 Discover out-of-the-way places like Carrieres des Lumieres and Tours et Remparts d'Aigues-Mortes. Get a sense of the local culture at Museum of European and Mediterranean Civilisations and Palais des Papes. You'll find plenty of places to visit near Marseille: Chateau des Baux de Provence (in Les Baux de Provence), Eglise Saint Jean-Baptiste (in Sollies-Pont) and Stand-Up Paddleboarding (in Cassis). Spend the 12th (Fri) exploring nature at Parc national des Calanques. There's still lots to do: explore the striking landscape at Calanques, take in the spiritual surroundings of Basilique Notre-Dame de la Garde, steep yourself in history at Paroisse Cathédrale Saint Sauveur Aix-en-Provence, and see the interesting displays at Fondation Vasarely. To find reviews, where to stay, photos, and more tourist information, you can read our Marseille trip maker site . Traveling by flight from Zurich to Marseille takes 4.5 hours. Alternatively, you can do a combination of train and flight; or drive. Prepare for somewhat warmer weather when traveling from Zurich in July: high temperatures in Marseille hover around 88°F and lows are around 68°F. Finish your sightseeing early on the 15th (Mon) so you can travel to Bordeaux. With a long history of producing regional wines since the Romans brought grapevines here during the first century, so many people consider Bordeaux to be the wine capital of the world. Visit Monolithic Church of Saint-Emilion and Chateau de Cazeneuve for their historical value. Get a sense of the local culture at Place de la Bourse (Place Royale) and Eglise Collegiale de Saint-Emilion. You'll find plenty of places to visit near Bordeaux: Maison du Jouet Rustique (in Pujols), Zoo de La Palmyre (in La Palmyre-Les Mathes) and Saint-Emilion (Chateau Laniote & Galerie d'Art Contemporain L'orange Bleue). Dedicate the 18th (Thu) to wine at some of the top wineries in the area. There's still lots to do: make a trip to The Water Mirror, take in the spiritual surroundings of St. Andre Cathedral (Cathedrale Saint-Andre), test your team's savvy at popular escape rooms, and see the interesting displays at Paleogalerie. To find traveler tips, other places to visit, reviews, and other tourist information, go to the Bordeaux trip planner. Fly from Marseille to Bordeaux in 3.5 hours. Alternatively, you can drive; or take a train. In July, Bordeaux is slightly colder than Marseille - with highs of 80°F and lows of 61°F. Finish up your sightseeing early on the 20th (Sat) so you can travel to Madrid. The Walls of Avila and Catedral de Segovia will appeal to history buffs. Alcazar de Segovia and Museo Nacional Thyssen-Bornemisza are good opportunities to explore the local culture. You'll find plenty of places to visit near Madrid: Toledo (El Transito Synagogue and Sephardic Museum & Monastery of San Juan de los Reyes), Segovia Aqueduct (in Segovia) and Avila (The Four Posts, Iglesia de San Martin, & more). The adventure continues: admire the masterpieces at Royal Palace of Madrid, contemplate in the serene atmosphere at Real Basilica de San Francisco el Grande, take in the architecture and atmosphere at Royal Chapel of St. Anthony of La Florida, and examine the collection at Prado National Museum. To see other places to visit, reviews, traveler tips, and more tourist information, read our Madrid day trip planner . Fly from Bordeaux to Madrid in 4.5 hours. Alternatively, you can drive; or do a combination of bus and flight. Traveling from Bordeaux in July, expect Madrid to be a bit warmer, temps between 94°F and 68°F. Finish your sightseeing early on the 26th (Fri) to allow enough time to travel back home.